Our next Original Vintage Poster Auction on Saturday 1 July will start online at 3pm (UK time) via Live Auctioneers and The Saleroom. A preview will be open at our gallery from Wednesday 28 June until 12noon on Saturday 1 July. This auction will feature a unique collection of London Underground posters and memorabilia alongside a wide variety of over 300 original vintage posters from around the world – travel, cinema, sport, advertising, war, propaganda. New and experienced collectors and dealers will benefit from our low starting prices with no reserves. Worldwide delivery. To accompany the auction, we are pleased to announce that the former Marketing Director of the London Underground, Dr Henry Fitzhugh, will be giving a talk at our gallery. Dr Fitzhugh introduced the Art on the Underground series, commissioning leading artists of the day, including many Royal Academicians. The initiative was seen as good decoration for the stations to benefit passengers and as a way of continuing the Underground’s long history of responsibility towards art and heritage. The talk will start at 6:30pm on Thursday 22 June. Tickets cost £5, available online [click here] and at our gallery. 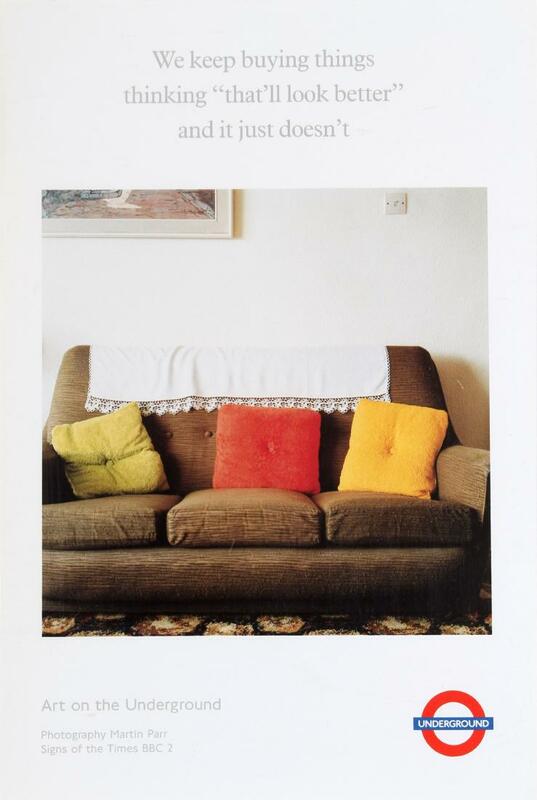 [via our Facebook page] In the Spotlight: the subtle humour of the Signs of the Times series by the notable British photographer Martin Parr for a fly-on-the-wall BBC documentary on people’s homes in the early 1990s. 100 years ago, in April 1917, the American Congress voted to declare war on Germany, followed by a declaration of war against Austria-Hungary in December 1917. Although keen to remain neutral and keep out of the war, America had started to build up its military forces as a defensive measure following the sinking of the Lusitana in 1915 by a German U-boat, killing 128 American citizens. In 1917 German submarines resumed sinking ships crossing the Atlantic, including American merchant ships, and President Woodrow Wilson asked Congress to “make the world safe for democracy” by voting in favour of war. Joining the war as an independent power, the U.S. provided supplies, raw materials and war loans, and sent soldiers to join the allied forces on the Western Front in 1918. Their involvement ultimately led to a victorious end to WW1 in November 1918. At home, Americans were encouraged to help with the war effort by increasing the production of munitions and food supply to support the country and troops. A nation-wide propaganda campaign to educate and enforce a sense of patriotism across the whole population included speeches at public gatherings, news articles and the display of posters. Most of these posters were torn down and destroyed after the war; those that did survive now form an important part of social history.